Congratulations to Angela Merkel. 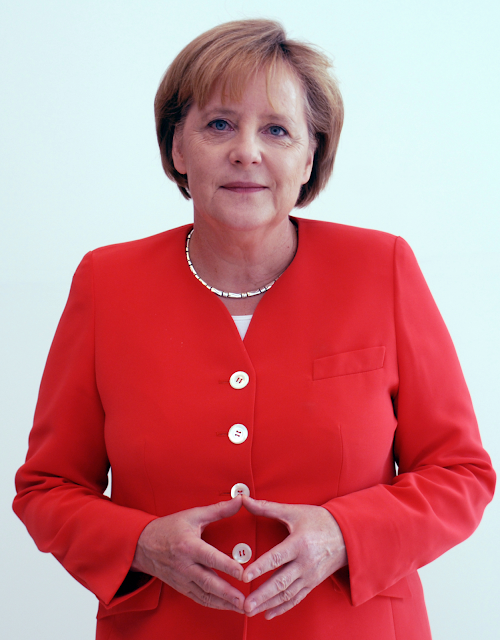 Yesterday she was elected to her third term as Chancellor of Germany. She is one of the few European leaders to weather the storm of the great recession and is on course to overtake Margaret Thatcher as Europe's longest serving elected female leader. Germany is the fourth largest economy (nominal GDP) in the World and many feel that Merkel is to be credited with helping to pull Europe out of its financial crisis. She is also the most powerful woman in the World. 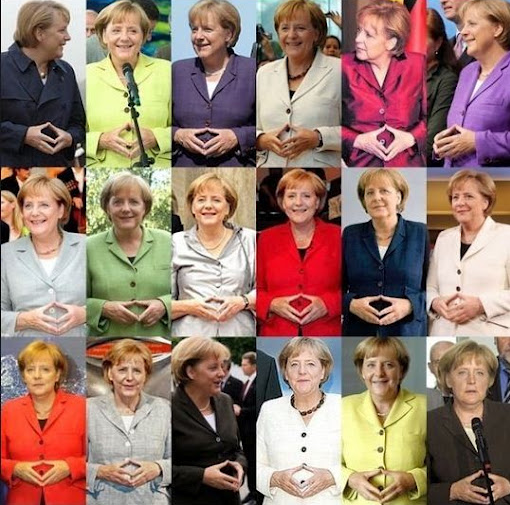 Despite Mrs. Merkel's success, she has one body language habit that is especially rapport destroying - the over-used Conventional Steeple. As an a athlete who meets with success early in her career, she perhaps partially attributes her winnings to factors which in reality do not contribute, and moreover detract from her ability to connect emotionally with the German or any other people. The conventional steeple, whether held low [as does Frau Merkel overly habituates (see collage image below) and some have said she uses this as a "trademark"), moderate (held roughly at the level of the sternum] or high (in front of the neck or face) is signal that sends messages of high-alpha emotions. The higher the steeple is held, the stronger its meaning. It is a significantly assertive body language sign and is correlated with a very elevated confidence level (take note there are several other types of steeples, such as the basketball steeple, the one-handed steeple, the pistol steeple, etc. which all connote different meanings). Betas do not use the conventional steeple in the company of alphas. However as with all alpha nonverbals, when the conventional steeple is over-used it becomes hyper-alpha and it will back-fire and thus send strong signals of arrogance and condescending emotional tones. It does not take much to over-use this gesture. Its use carries a lot of weight and so care should be taken to display it in a deliberate and conscious fashion (essentially choreographed into a speech or discussion) and only for a few seconds when a particularly important point is being emphasized. The vast majority of those who use the conventional steeple will over-use it though - so people will often feel patronized. Therefore when it is over-deployed, the conventional steeple will destroy rapport and offend. With the exception of a few such as some news reporters (where bizarrely, the conventional steeple is professionally entrenched) and others who have adopted this forced behavior which then becomes a bad habit through ill-advice or mirroring another (and I believe Chancellor Merkel is one of these exceptions) - those who over-use the conventional steeple also have a high correlation with Narcissistic Personality Disorder.